Not only is splicing a satisfying art, making up your own dock lines will save you money, why pay someone to do something that is so easy. And you can tailor those lines to suit your own boat rather than having to buy stock lengths. 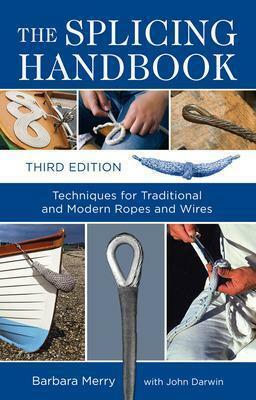 Once you have mastered the basic technique there are numerous other uses such as anchor lines that require an eye with a metal thimble to protect the line from chafe, rope ends that need tidying or lines that need joining. Where a permanent join or eye is required in a line, splicing will not only look much neater and more seaman-like than a knot but will also be much stronger. You only need a few basic tools, a sharp knife with the emphases on ‘sharp’ so the ends can be cut cleanly and a marlinspike or fid to separate the rope strands. The marlinspike is a round pointed spike used to lift and separate the individual strands. A Swedish Fid will do the same thing with the advantage that the ‘hollow’ side makes it much easier to thread the strand to be tucked. When working with synthetic ropes a heated rope cutter will hep seal the ends and prevent unravelling, a cigarette lighter can be used but this will have a tendency to blacken the ends if you are not careful. On the other hand some tape such as the cheap electrical type is fine for temporarily holding the yarns to stop the ends unravelling. And as I will explain later I also use my ‘Handy-Stitcher’ and some whipping twine. 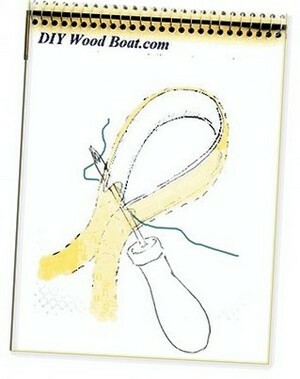 It is always best to use good quality rope on board and the better the rope, the easier it is to splice. The strength of any splicing will increase with the number and tightness of the ‘tucks’. However, the first four or five are the most important, any subsequent ‘tucks’ will have a decreasing effect on the overall strength. The first thing to do is to slice the rope end cleanly with that sharp knife, if you wrap the end with tape first then cut through the middle of the tape it will hold the strands until you are ready to unravel them. Decide how much of the bitter end will be needed to give the required number of ‘tucks’. You should allow a length of three times the rope diameter for each tuck, so for five tucks allow a length of approximately 15 times the rope diameter. I am very much the amateur at this, I only do it on my own ropes, so not very often. The trick I use to get started without the rope unravelling too far is to tie a couple of whipping turns at the point where I want the splice to start. 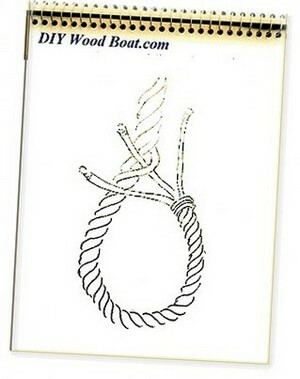 And I anchor the whipping by using my ‘Handy Stitcher’ to push one end of the twine through the rope. Then the rope can be un-laid as far as the whipping. The ends of the strands now need to be either wrapped with tape or heated with a flame to prevent the strands from fraying. Having the ends of each strand wrapped or heat sealed neatly and preferably with a point will make it easer to tread them through each tuck. When you begin ‘tucking’ try to keep the twist in each strand so it will lie neatly. The following is how I, as a right- handed person proceed, if you are left-handed you may find it easier to do it upside down, as it were. So, right-handers begin with the un-laid end towards you and the standing part pointing away and remember all the ‘tucks’ will go from right to left. Now fan out the un-laid strands. Use the fid to lift a strand on the standing-part of the rope as close to the whipping as possible. Now tuck the centre one of those un-laid strands under it. Pull this first tucked strand through firmly, not so hard as to distort the lay of the line. Next take the left-hand strand. The second tuck is always the left-hand ‘un-laid strand’, tuck it under the ‘standing-part strand’ above the one you just tucked the centre strand under. Now that remaining ‘un-laid strand’, the right-hand one, this wants to be tucked under the ‘standing-part strand’ below the one used for the center strand. So it is center first, then left above, then right below. Now that you have all three ‘un-laid strands’ tucked in once, pull them all firmly to snug them down, then the rest is easy. Just carry on tucking those ‘un-laid strands’ in turn, so that each strand goes under a strand on the standing part, then over the next then under again etc. Turn the rope anti-clockwise a third of a turn for each tuck and tuck the strands in sequence. When you have the desired number of tucks, pull on the rope to stretch it and roll it between your palms to smooth it out. Then trim off the ends of the tucked strands and the splice is finished. If the rope is synthetic you can melt the strand ends and press them tight to the rope. You can if you wish finish off with a few tapering tucks. Trim a third or so of the yarns from the tails, then continue to give these trimmed strands a few more tucks, then finish as above. The Back or End-Splice is used as a permanent way to prevent the bitter end of a line from unravelling. However, a splice does results in a thickening of the line, so if it has to pass through a block or such like then a whipping will be the preferred option. As the name suggests the strands are woven back along the line. And as this splice is merely to prevent the bitter end unravelling it doesn’t require strength, so three or four tucks will be more than sufficient. The only departure from the technique above is that it requires a ‘Crown Knot’ before starting with the tucks. For the ‘crown knot’ hold the rope with the standing end towards you and the ‘un-laid strands’ away from you. Then, working anti-clockwise, take any strand and pass it over its neighbour. Bring that neighbouring strand down across the other two. Now take the remaining strand over the second and through the loop made by the first. Tighten each strand by pulling towards you so the strands now lie along the length of the line. Now you are ready to carry on as per above. This is where a couple of ‘tapered tucks’ will be of some advantage should the line ever need to be hauled through a restriction. 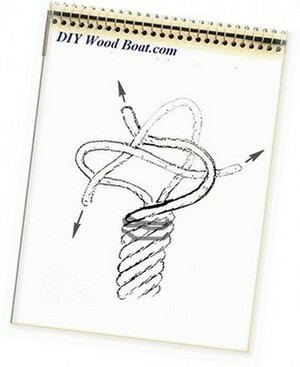 Tying a bowline is the quickest way to make an eye in rope. However, for maximum strength nothing beats an eye splice. 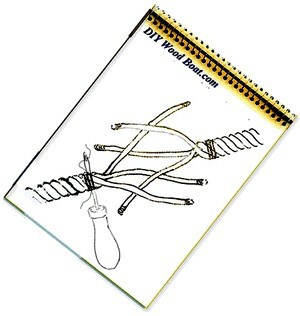 And with three strand rope it not only looks good but is an easy splice to do. You can buy lines with an eye already spliced into one end, but naturally you have to pay for this service. Personally I disagree with the concept of having dock lines with a permanent eye in one end because the wear is always restricted to that one place on the rope. However, when you do require a permanence loop at the end of a line, putting in your own eye plait is a neat and easy option, especially with three strand rope. Where an eye is subject to constant wear or chaffing such as where it is used to attach a line to metal fitting then a thimble should be inserted in the eye. Again the technique is the same as above. However, this is one instance where the start position of the plait must be really tight up to the thimble to prevent it falling out. And it is where I find using the Handy Stitcher invaluable. The short-splice is used to join two ropes of equal diameter and number of strands. weave the strands of each rope into the main portion of the other rope. Start by laying the strands of one rope between the strands of the other. Make the fist set of tucks of one rope into the second rope, then repeat for the second rope into the first. Once the first set of tucks on each rope has been established the rest can be done in any order. However, as splicing increases both the diameter and stiffness of the line the resultant join will not run through blocks and other fitting which are the correct size for the original rope diameter. For that reason this is unlikely to be seen on small boats these days. However, back and eye splices are worth the small effort not only for their strength and neatness but also as a testimony to your seaman like skills.